Low budget craft ideas are so important in a craft world dominated by very expensive craft supplies. So you may be really pleased to hear about how you can make one of these beautiful paper bead bracelets using rubbish that would usually get thrown away. You will need a couple of other supplies but the main material used in these beautiful low budget craft ideas is scrap paper. If you are new here, you may want to check out this video for other low budget craft ideas, but don\'t forget to come back and try out this one! And if you prefer to go straight to the tutorial to see the ideas I am showing you in this post, click here to go to YouTube. If you are here to find out where you can buy the tools I use in the video, scroll down to the end of this post to find the links. My favourite thing to do is go to my local card shop, buy a birthday card and then make a beautiful bracelet from the bag it came in. It\'s always tricky giving friends and family handmade presents. We all know that fine line between something that looks handmade because it\'s so badly done and something that is handmade but also very pretty and wearable. These little bracelets are brilliant if you are looking for low budget craft ideas for making presents or, even to make stuff to sell at craft fairs. The beautiful beads on the right were made from this small, flimsy paper bag that many people would throw away. And they make gorgeous, delicate bracelets. So you can see, low budget craft ideas don\'t have to look cheap. Most people are shocked when I tell them that the bracelet I have given them is made from the paper bag their birthday card came in. The beads actually look like they are made from china if you finish them properly with a few coats of glaze. And if you are someone who doesn\'t have a ton of money to spend, a well made hand crafted gift is a great alternative to a shop bought present. I would be touched if someone spent their precious time making me something. The beads below were made from a sheet of waste printer paper and wrapping paper from one of my birthday presents. I never throw wrapping paper away, even if it is torn. You only need a very tiny area of the wrapping paper to make these beads - watch the video to find out why. The low budget craft ideas I show you in my current YouTube video will probably get you thinking differently about scrap paper. The technique I show you for how to use the wrapping paper to make paper beads means that you can use any kind of printed matter as the base for the beads. So that means you can use old bank statements, letters, junk mail - anything that comes in a standard page size with a rectangular shape, or that can be cut into a rectangular shape as you see me doing in the video. What about the tools I use in the video? The paper bead rolling tool I use is my own design. I manufacture them myself and sell them online at a very reasonable price. I also design and sell the printed templates which you can buy online and download to print off but for those who don\'t have a printer, I have designed some paper bead strip template stencils that you place on to top of your paper and draw inside. The stencils come in one sheet with four different size stencils on it. Buy the 3mm Easy Beady paper bead rolling tool - £7.00 - ships worldwide. Please note the special free offer below, when buying both tools together. Buy the 5mm Easy Beady paper bead rolling tool - £8.00 - Ships worldwide. Buy the Easy Beady paper bead strip stencil - £5.99 - Ships worldwide. Buy the Easy Beady printable paper bead strip template in 1 inch tapered - £2.38 instant digital download. When you buy the 3mm and 5mm tools together using this link FREE OFFER, you will get the stencil completely free. Just click on the free offer link and you will be taken to my etsy shop. I ship worldwide. Come back soon because I will be giving you details of the new paper beading products I am adding to my range in the very near future. All my Easy Beady products are designed to make paper beading easier and quicker. And if you are looking for any of the other craft supplies I use in my videos, visit my Amazon craft supplies page, Rainbow Lane. For those people who don\'t have access to a craft store or who don\'t have time to search around online, I have created this page where you will find some of the products I use and some other products that are similar. However, I do urge people to shop around to find the craft supplies they need - my Amazon page is there to give you suggestions if you don\'t know where to get your supplies. I hope you enjoyed it and are fired up with some low budget craft ideas - see you next time with more crafty ideas for you! 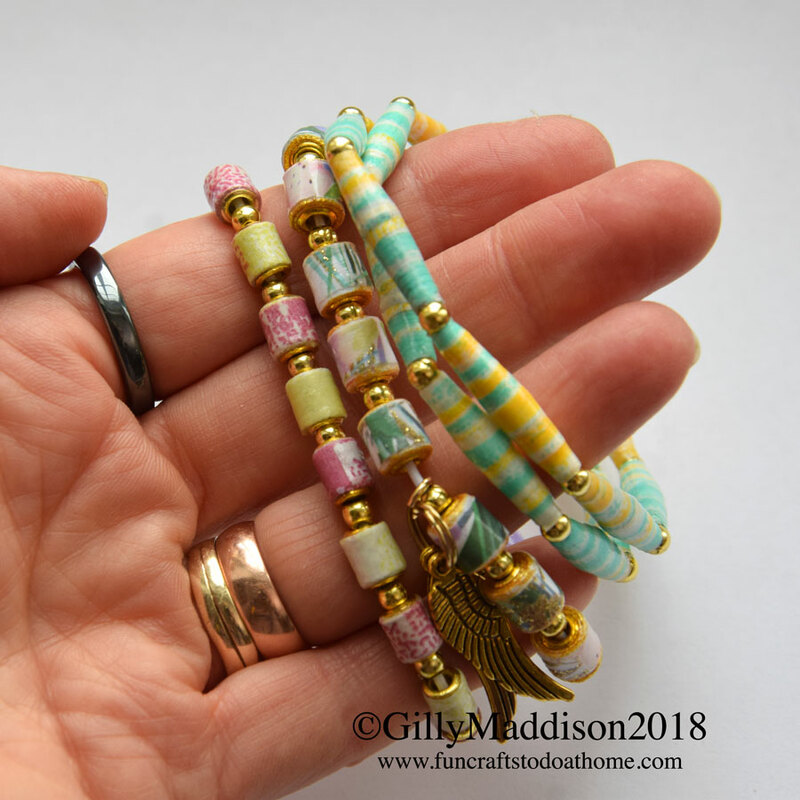 Previous Previous post: Alcohol Ink Jewelry – Paper Beads With A difference.